The most important part of giving any type of massage is making sure that the person being massaged feels relaxed and comfortable. And as the person giving the massage, it is your responsibility to make sure that happens. This rule is no different for when you learn how to give a deep tissue massage and it may be even more applicable because of the techniques used for deep tissue massages. Before we get into the details of how to relax your client, the benefits, and how to give a deep tissue massage, it is important to know what it actually is. So, what exactly is a deep tissue massage? A deep tissue massage is “massage” delivered to the muscles on a deeper layer. It requires the muscles being warmed up before getting into a greater level of depth. Swedish massage strokes are recommended to start before the deep tissue massage as you will be pressing deep into the muscles. Furthermore, deep tissue massaging accesses down under the surface layer and needs more strength and sustainability. Many people think that a deep tissue massage has to hurt in order for it to work, which is not true. A great deep tissue massage can be delivered when you focus on the client’s needs and balance the barrier of relief and pain. Lastly, deep tissue massages require a much slower pace than other massages. This allows you to properly get into the muscles and apply the right amount of pressure under control. Utilizing body weight: Learning to properly use your body weight will save you time and energy. Instead of pushing against tight tissues you can lean against it. This will cause the tight tissue to loosen up because your body weight will keep consistent pressure against it. This is what the best massage chairs are capable of doing really well, they manage the scale without going overboard. Furthermore, constantly pressing and pushing can be tiring and lead you to working too deep. Massage towards the heart: It is always best to apply pressure in the direction of the patient’s heart. For example, if you are working on the legs, you should work from the ankle up, towards the heart instead of away from it. This promotes healthy blood flow towards the heart, something we've seen Human Touch direct their attention to in recent years. Table height: It is extremely frustrating to massage someone who is higher than your body. Find a table that you can drop your weight down onto as this will allow you to increase the amount of pressure you can apply. Layer-to-Layer: If you massage with patience and care you will be able to efficiently move from layer to layer. The client’s body will slowly open up and so will the tissues. Work the area, not just tightness: When you find a tight muscle that requires additional pressure you should also work the area. By focusing on the surrounding body surface you can help loosen the muscle giving you trouble. It all starts with the environment that your client feels and experiences. Imagine you are about to get a deep tissue massage and the room you’re in has an unprofessional atmosphere and lacks the important factors to relax you. Not only would this ruin your massage, it might put you off from getting future massages. This leads us to the first step, make sure your environment is relaxing. You can do this by lighting candles, playing soft music, and having flowers in the room and around the table to calm the environment. This will allow your client to unconsciously let the tension out of their shoulders, arms, and neck, which will make it easier for you to massage them. When you give a deep tissue massage the person you are massaging won’t have on any clothing and this can make people feel exposed and vulnerable. In order to reduce and eliminate this feeling, you should drape the person. You should also make sure you cover the areas you’re not massaging at the moment. This will help the person relax and feel at ease with the entire process. Start by applying massage oil to the persons back. Make sure you ask if he or she has any allergies to any type of oil. Once you have the oil, apply it across the back of the person and use large strokes to spread it out evenly. By using broad strokes you can apply extra heat which will help the oil melt and relax the muscles. Aside from feeling relaxed and rejuvenated after a deep tissue massage, there are many other benefits. Below you will find the top 5 benefits. Stress Relief: Stress affects everyone and prolonged stress can have a negative impact on your life. A deep tissue massage can help reduce the effects of stress in your life, whether it is from work, home, or both. This is more important than ever because of the fast-paced lifestyles people are adopting. A research study from Brown University found that stressful life events can lead to panic symptoms that get worse over time. Reduce Chronic Pain: Medical Center researchers at the University of Maryland reported that a deep tissue massage can provide a more affordable and effective choice for relieving and reducing chronic pain than traditional medical therapies. This is because deep tissue massages help in reducing inflammation in the body and increasing blood flow simultaneously. Injury Rehabilitation: Deep tissue massages help facilitate the removal of toxins from injured muscles. In fact, we often see injured athletes turn to trusted sources, like Osaki chairs because of their deep-tissue massages that help heal strained muscles. Improve Movement and Break up Scar Tissue: By massaging damaged ligaments, muscles, and tendons you stimulate your body to achieve an improved range of motion. Scarring from deeper injuries requires greater pressure relief to be applied which in turn makes it easier for you to move around. As time goes on, deep tissue therapy can break up and wipe away scar tissue. Lower Blood Pressure and Heart Rate: A 2008 study found that the heart rate of 265 volunteers, with muscle strains and aches, lowered by 10.8 BPM after a deep tissue massage. Furthermore, it has been reported that deep tissue massages are beneficial for lowering blood pressure as they increase serotonin production in the body. The first step is making sure the person is relaxed, draped, and comfortable. Read our section on how to relax your client before beginning the massage. Before we get into deep massaging we want to warm up the muscles. To do this you want to start with Swedish massaging techniques that use smaller strokes. Use a lotion as it provides a better glide to warm up the muscles as opposed to oil which is slippery. To start the massage you want to apply oil and use your palm for short calm strokes. As the muscles begin to warm up, use your body weight to increase the pressure of the strokes. Without putting pressure on the spine, apply pressure to the muscle along the side of the spine. You want to slowly increase pressure with your strokes and continue the length of the muscle. Using your fingertips, massage from the lower back to the shoulder region. As you get a feel for the muscles keep your fingertips together and use sideway strokes to increase pressure. With your body weight, you want to engage the tissue. This involves using your forearm to apply pressure to the shoulder region by placing it on the inner area of the back. From there you want to work your way down the back and through each layer. Naturally, your forearms will get to the first tissue layer and then go deeper and deeper the longer you massage. This will be painful at some points for your client but, if your client begins to resist your movements then it is time to ease up. Once your forearm gets to the bottom of the back, you will want to get right above the buttocks. To start, turn your arm sideways and go up the back and along the outer edge. Continue this motion until you reach the shoulder area. To finish up, use your hands to apply pressure from the shoulder area down to the middle of the back. Apply oil to the legs and start with small pressure strokes with your palms from the ankle. Slowly work your way up each leg. Starting again from the ankle, apply pressure with your forearm and body weight to work into the deeper tissue layers as you move up each leg. After you have gone up each leg with your forearm, use your thumbs to pressure the calf. First, locate the middle of the calf and then use your thumbs to push outwards. Although the calf is one muscle it does have two heads. Find the groove in the middle and use it to guide your thumbs. When massaging the arms you will be using the heel of your hand. With your client on their back, work your way up the arm towards the shoulder area. Again, use your body weight and knuckles to create circular motions. Using your thumbs, one on each side, apply pressure to the forearm region. Work from the wrist toward the elbow. Lastly, use your thumbs to massage the client’s hand. It is important to be extremely careful as this area can become quite sensitive. Start by placing your thumbs beside one another on the inner wrist. Simultaneously move both thumbs over the wrist and continue to apply pressure. Avoid the Spine: It is important that you remain vigilant and aware of where you are applying pressure. It is best to avoid the person’s spine as you damage it and cause pain. Health Discussion: Talk to your client about any health issues or conditions they have. Talk to them about past injuries or any problems that you should be aware of. Be aware: As you massage your client, you want to communicate with them. Ask them if the pain is too much or if they need a break. Pay attention to their body language as well, if they tense up, curl their toes or retract their body then you are most likely applying too much pressure. 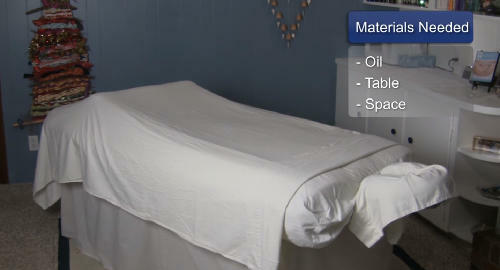 Below you will find 2 videos that provide great information on how to give a deep tissue massage. The video on the left is a quick tutorial that gives you a clear idea of how to begin. And the video on the right is a professional CEU training video from Media-Spa. Getting a massage that is too rough and painful is one the worst experiences. This usually happens when the person giving the massage hasn’t done their research and lacks the proper knowledge. In the beginning, you will struggle with giving a deep tissue massage because it requires intimate balancing of relief and pain. However, over time you will quickly learn how to work the muscles and get through tight tissue areas. To learn more massaging techniques, read our full tutorials on shiatsu massaging and understanding the differences between Swedish and shiatsu massages and chairs.